In this first volume of 26 Christmas carols, they are included compositions written over the last 20 years. Are songs composed specially for the choir of mixed voices, a cappella and some chants accompanied by the organ. The texts are taken from ancient sacred texts, from important authors, and some were written by me personally. Most of the lyrics are in Latin, some in English and others in Italian. The songs are composed in decidedly classical style type motet, madrigal, hymn, etc., except for someone who is in a modern style. 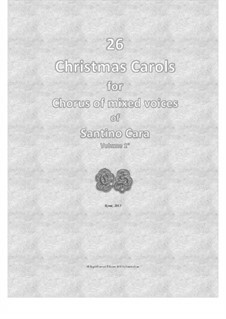 In this first volume, I have tried to diversify the various emotional moments that a major event like Christmas can have a decisive influence on a composer of Sacred Music.